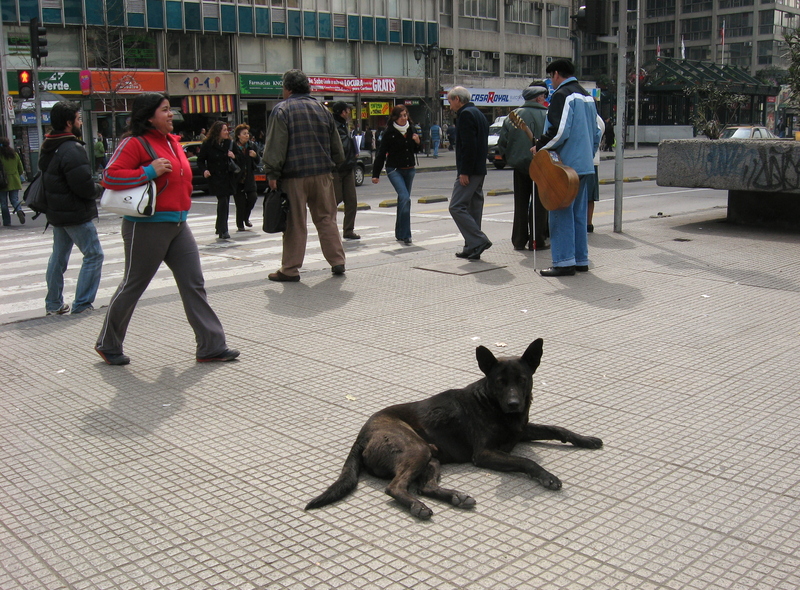 There are a lot of street dogs in Santiago. In the beginning, I took a tour and they were talking about street dogs. Usually, they are on the street for two reasons – one is sad, and one happy. Let me start with the sad one, which is the least likely scenario. People buy a little puppy. From a puppy becomes a dog and is too big or as the tour guide said, not as cute, so people just kick the dog out of the streets. It is a little bit ironic, because Chile has very strict rules about hurting animals. It is very strictly against the law to do anything to any animal. Actually, my friend got brought to the police station, because he was sitting on the bench and this street dog kept coming at him, so he pushed him away. In Chile you cannot even do that, which is how the law is strict. It is ironic because they have such as strict rules about hurting or even touching dogs when they are on the streets, but not punishment for people that kicked the dog out. Street dog on the street in Santiago. The second reason is a little happier. Many times you can see a street dog, which is very well fed and taken care of. In this case, the owner usually has a small flat or he wants the dog be happy, so one let the dog out on the streets. That being said, many times you can see a little door or a whole in the main door, so the dog can come back anytime and drink some water or eat. Sometimes even the owner leaves bowls of water and food outside, on the street, so the dog can get it anytime. It is like letting the dog on the backyard, except this backyard is the city of Santiago.